Chairman of South Gloucestershire Council, Cllr Ian Boulton, presenting our school crossing patrol staff with a certificate to mark 60 years of school crossing patrols. In South Gloucestershire, we have 29 women and nine male staff members covering 38 schools across the district who were invited to attend a thank you event. Chairman of South Gloucestershire Council, Cllr Ian Boulton, presented them with a certificate to mark this important milestone. Joan Crossland is our longest serving member of staff. She works at Beacon Rise Primary School in Kingswood and has clocked up 24 years service. At 71, John Pitt is the eldest and at 23, Simon Hawker is our youngest member of the team. At Longwell Green Primary School there are two crossing patrol staff. Sandra Sperring and Deborah Beale started in 2009 and say it is a very rewarding role. Sandra started out as a dinner lady at the school and then took up a cleaning role which she does in between her twice daily road safety routine outside the school gates. 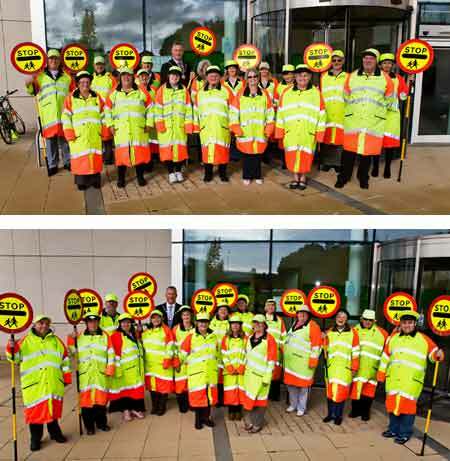 If you are interested in joining our dedicated team of school crossing patrol staff you can call us on 01454 863611 for more details. You will receive full training (and a uniform).